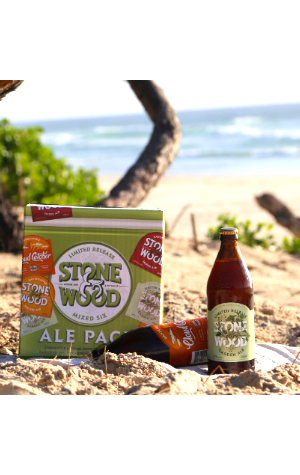 The story behind the arrival on bottleshop shelves of a new mixed, large bottle six-pack from Stone & Wood for summer starts with the Cloud Catcher. The beer originally released to mark the opening of a second brewery at Murrwillumbah – a delightful fruit salad explosion – proved so popular that the brewers were inundated with requests to bring it back. We can well understand this as when we were lucky enough to be given a pre-release sample at the brewery earlier this year we got about as far as two sips before asking: "Will you be making it a permanent release?" So bring it back they have, with a new label design to boot. And, realising they had plenty to go around, they decided to mix things up a little too, packaging one Cloud Catcher alongside two bottles each of their ubiquitous Pacific Ale and red ale Jasper as well as a single bottle of Garden Ale, the British pub garden style quaffer that's available year round in their Northern NSW haunts but only seasonally for the rest of us.